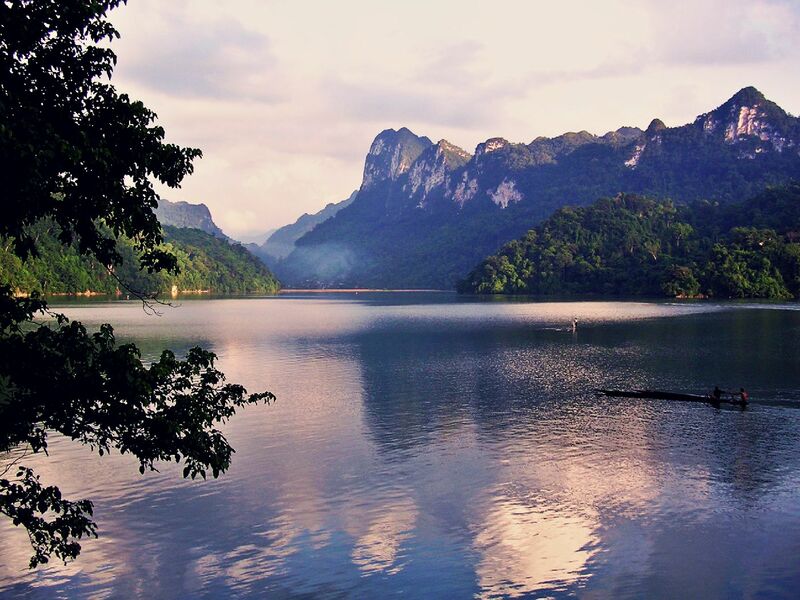 As legend had it, Ba Be Lake in Bac Kan province was the result of a dragon's wrath that transformed a whole vast valley into a freshwater lake. 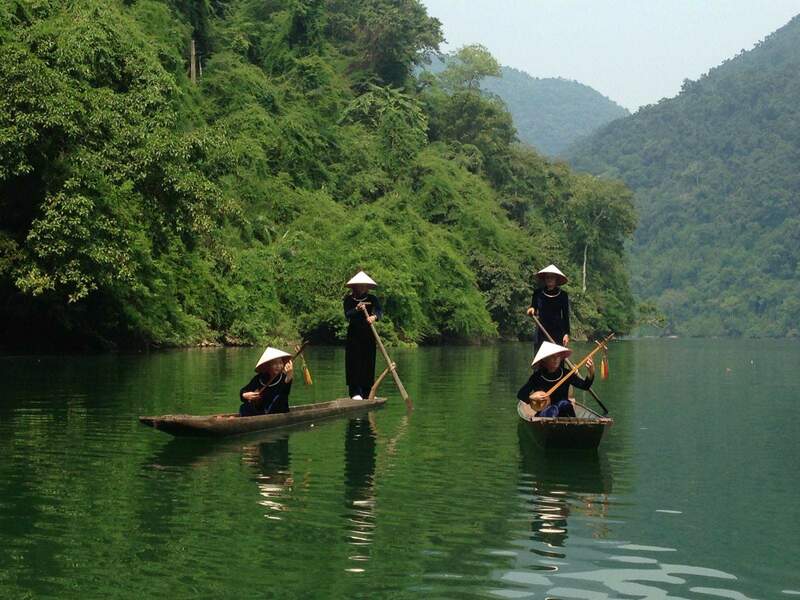 Vietnamese people have been calling Ba Be as the ‘pearl of northeast Vietnam’ for its refreshing, nature rich landscape and an ethnic local culture. Ba Be has it all – primitive natural systems, indigenous cultural background and a lot of things to do. In this article, we’ll show you all these information, together with how to get to Ba Be lake, where to stay, day trips from Ba Be and what to eat…. 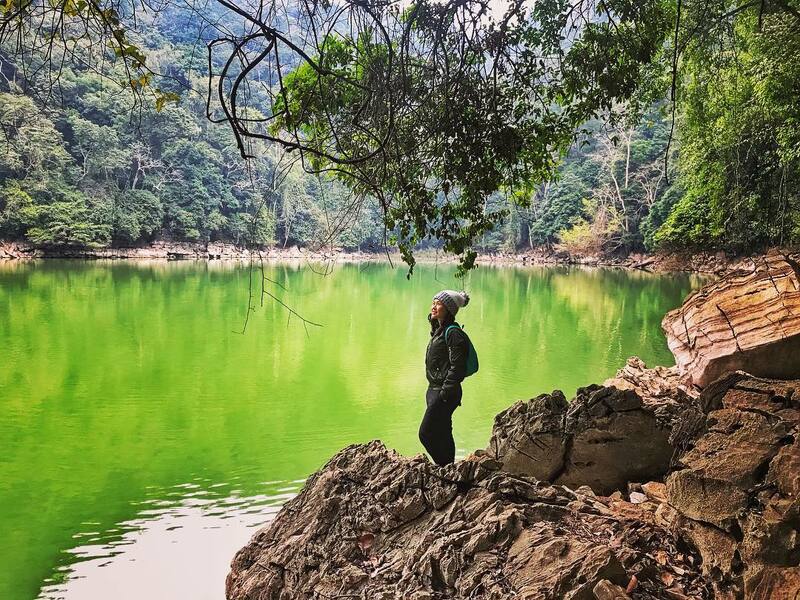 Lying at the north of Bac Kan Province, deep in the core zone of Ba Be National Park, the three freshwater lakes of Ba Be (Pe Lam, Pe Lu, Pe Leng) spread on a total area of 5 million sqkm with the depth of water reaching down to 35m deepest. The lakes are located on a height of 145m above sea level, with 8 kilometers of the lake covered with cave and underground stream system. With this vast body of water and diversity in biology and geology, Ba Be Lake has important values in nature preservation in North Vietnam. The birth of Ba Be lake was associated with a very famous legend. Once upon a time, a leper visited to a festival held by Nam Mau villagers, only to received hostility and discrimination from the host villagers for the disease she had. But one widow and her son showed this old poor woman kindness and invited her to their house and let her stay that night. In midnight, both of them were roused by the loud roaring noise, they found out a dragon instead of the old leper woman. When morning came, the old woman told them the truth that she was a higher being that had come down to test the villagers and decided to punish them with a cataclysm. The woman and her son were the only ones spared from the calamity for the good deed they’ve done. They were given a 2 pairs of rice husks to rescue people when everything got calm. After the flood was gone, a huge valley became the immense lake, called Be Be as today. *What to do in Ba Be: you can swim, enjoy rafting, dug-out rowing and especially kayaking. 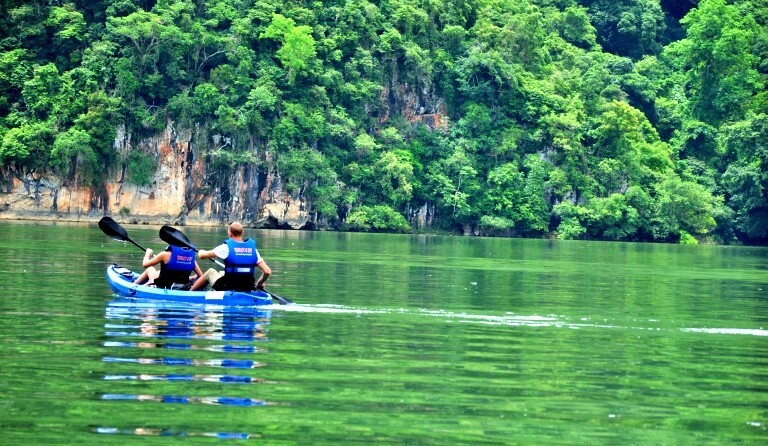 The most common route for kayaking is from Buoc Lom Quay to Puong Cave, Dau Dang Waterfall and to the lakes. 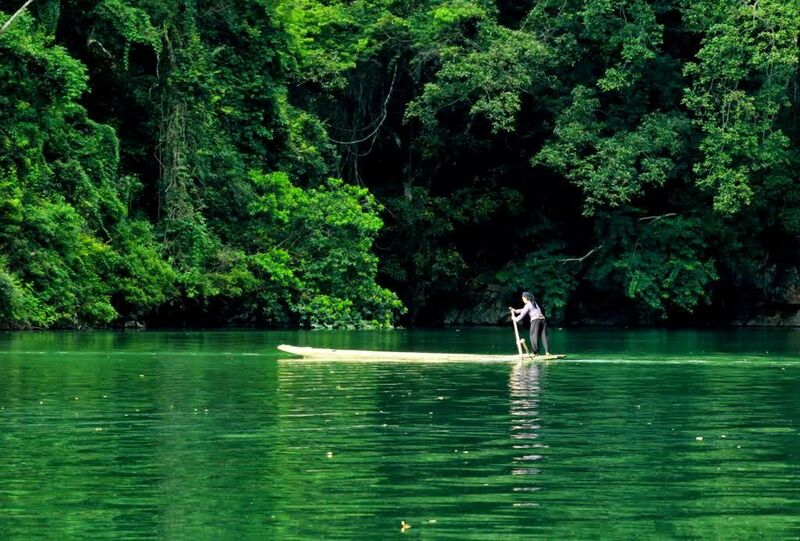 Ba Be is the deepest natural lake in Vietnam and swimming in Ba Be lake should be considered carefully. Widow Island is the most suitable site for swimming since it's only 18m deep. You can also jump from the island into the lake, from a height of 5 meters. However, consult your tour guide before swimming. 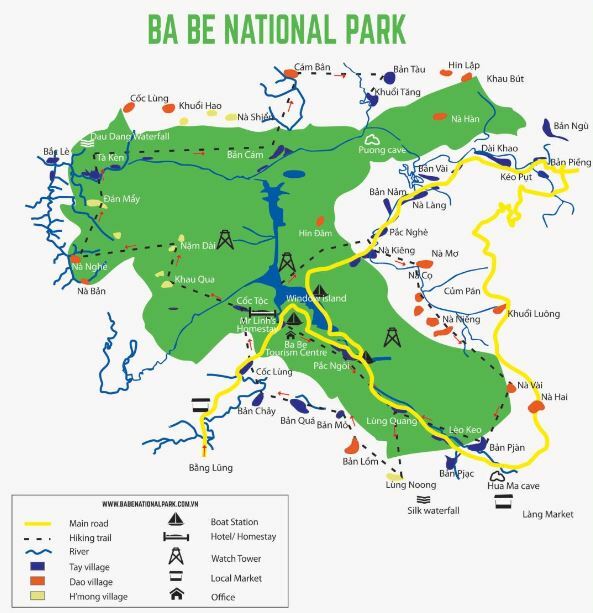 Ba Be National Park was officially opened in 1992 as an effort to protect the biology diversity of the region. Surrounding mountains are made up of limestone karst, consist of mostly evergreen forest, caves and are home to many ethnic villages. The bio-diversity of the lake can be seen in the number of 100 different types of freshwater fish while caves and mountains offer habitats for 65 mammal species including macaques, langurs, Chinese pangolins, slow loris, red giant flying squirrels and 18 species of bats. For reptiles, there are 43 different species found in the park including lizards and snakes. Butterflies, birds are also thriving in the park. On flora, there are 1281 species of plant, some of which are listed in red books of Vietnam and the world and some are considered as precious plants. Trekking is the most popular activity to do in the national park which offers you a chance to see the richness of nature here. A common trekking route is going through the jungle and reach the ethnic village like Coc Toc village and some H’mong villages. 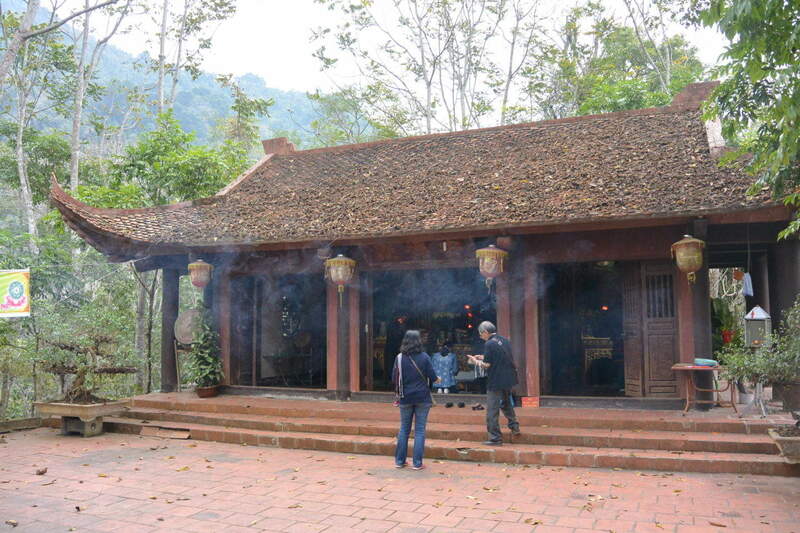 Or you can trace along the trail along Nang river to see Dau Dang waterfall and Tay villages. Bicycling is also another worthy thing to do in Ba Be Lake National Park. Starting from Pac Ngoi, you will visit Tay villages, Hua Ma Cave and Silk Waterfall. The road here is in good condition, so you don’t have to worry about safety. Not only is the worthiest ethnic village to visit in Ba Be, but Pac Ngoi also the base where you start your trip to visit other parts of the national park. Pac Ngoi is home to a large Tay community with more than 40 traditional stilt houses located on a mountain hill. 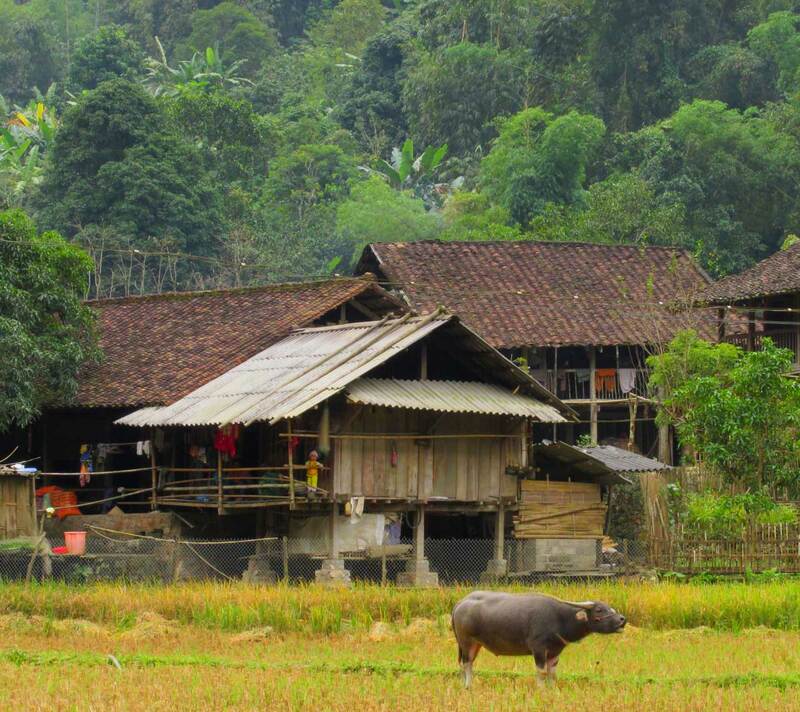 These traditional houses are still well-preserved in Pac Ngoi just like the Tay culture here is still practiced by the ethnic people. Pac Ngoi is also an ecotourism site in Ba Be which strives to success in sustainable tourism. Come to Pac Ngoi, you’ll have a feeling like this village is a paradise hidden away from the world, lying so peacefully surrounded by misty mountains and mirror lake. Besides activities related to trekking, bicycling, kayaking activities, you shouldn’t miss homestaying in Pac Ngoi. It will you an opportunity for a better understanding of the local culture and way of life. 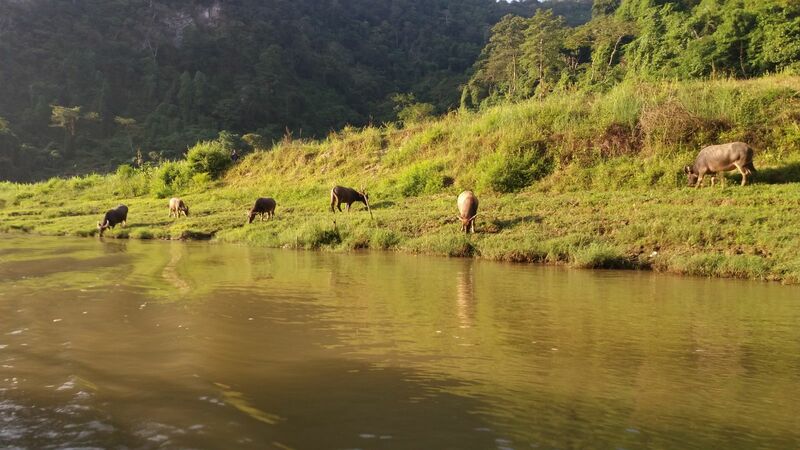 All kayaking tours will take place on Nang River with most attractions around Ba Be to visit along the way. Starting from Buoc Lom Quay, a kayaking tour will pass Puong Cave, Ban Cam Village and Dau Dang Waterfall before coming to three lakes of Ba Be. The cave welcomes you with an impressive entrance of 30-m high white limestone gate, only accessible by waterway. 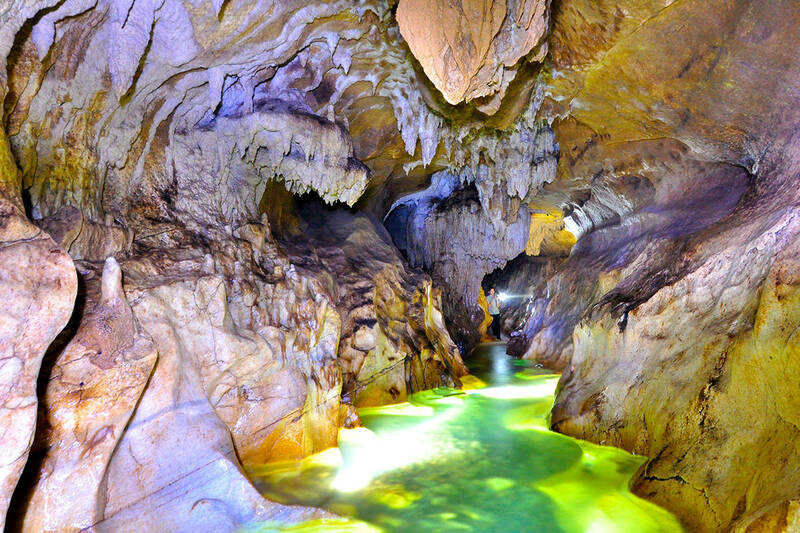 Inside, Puong Cave is 300m long, features colorful stalactites in all shapes and sizes. Visit Puong Cave, you can see the story of Nang River’s eroding broke through the other side of the mountain over the years. This cave is edge, imposing yet at the same time gentle with a great look out to the river. 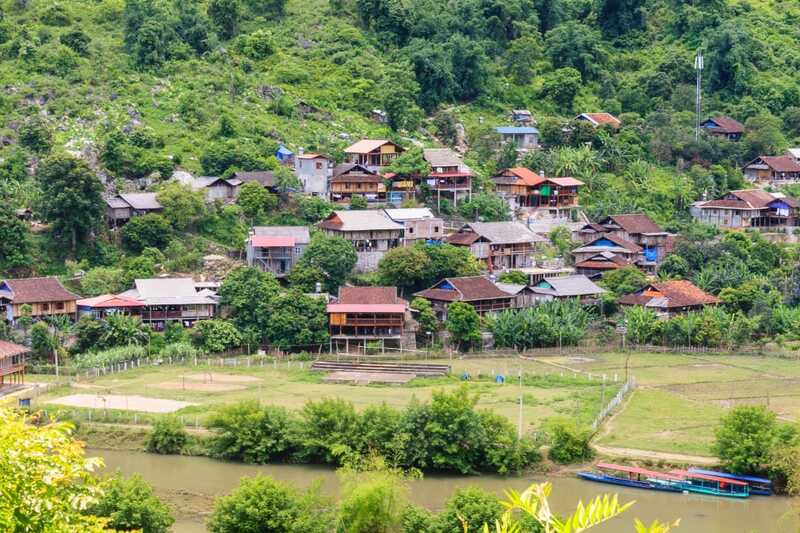 Continue on Nang River, you’ll see Ban Cam village lying on a valley on the riverbank, creating such a nostalgic and serene sight which is opposite to the mysterious Puong Cave. Even from the river, you can see the villagers fishing on their traditional dugout boats. Next stop is Dau Dang Waterfall, located on far west side of the river. Here, the serenity ends and you might have an impression that you’re on a total different river. The fall lies between two karst formations, set in three tiers of huge rocks up and down and thick foliage of forest. The fall is not wide enough so the water flow here is bottled up, creating such a misty sight of nature. When your kayak begins to come into the first lake of Ba Be, you’ll see Fairy Pond right on your left. To visit Fairy Pond, you’ll have to walk on land. The pond is neatly nested in the mountain, so clean and remote the only things you can see there are either wildlife or local fishermen. The name of the lake, like those of many other streams and waterfalls in Vietnam, was named after a story of a local hunter when passing by the pond catching the sight of the fairies swimming here. And the beauties of the pond to explain the taste of the fairies in choosing bathing place. When you enter the second lake, The An Ma Island is located right at the center of the lake. The island was believed as the living place of the widow and the son after rescuing Nam Mau villagers. When the widow died, the people built An Ma temple to worship and remember her good deeds. Annually, the local people here hold a festival to wish for fortune and peace on 6th day of the second lunar month of the year. 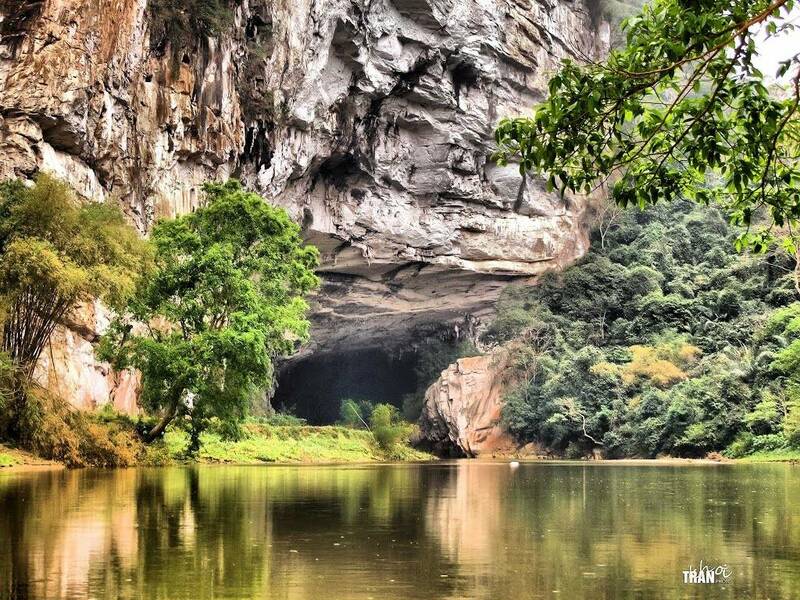 Located at the far south part of Ba Be National Park, Hua Ma is another great cave with gorgeous karst formations. The cave’s entrance is 3m wide and 5m high, lying deep inside Co Don Mountain (Lonely Mountain) and Ghost Forest. The reason for the mountain and the forest to have such gloomy names is related to the legend of a general who came to the forest to patrol and heard the howling sounds the lost soldier’s souls residing in the forest. The general decided to killed a horse as a tribute to the souls and in doing so, he helped freeing them. It’ll be a thrill to visit this cave after hearing such a story but the once you’ve come inside Hua Ma, the beautiful stalactites will please you to no end. It’s a must-see site in Ba Be. This cave is a newly explored site pretty recently and already has become one of the best attractions in Ba Be Lake for its mysterious, otherworldly beauties. However this cave is only for true adventurers because it spread 3-5 kilometer in length with a quite low and narrow passage. A 1.5km long stream and a 2-4km long stream make the cave even more sparkling under flashlight. Once you’ve reach pretty deep inside, you’ll see the incredible rock formation, beautifully formed stalagmites and stalactites, huge columns in unbelievable shapes and colors. 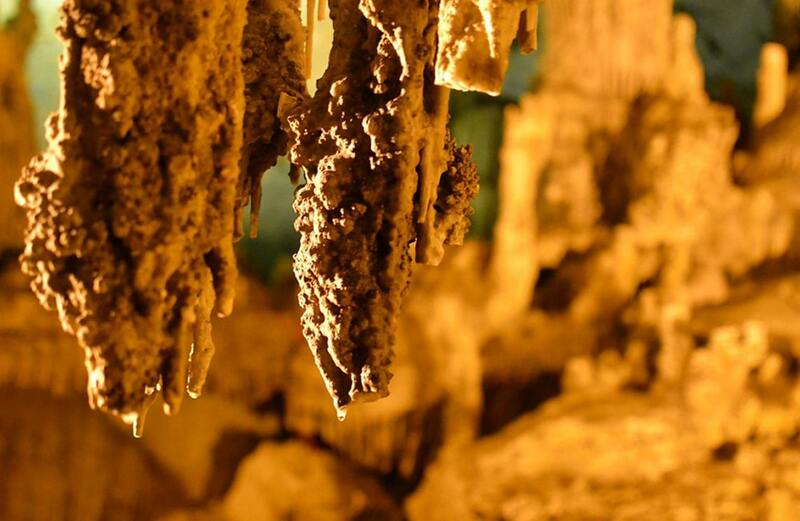 If you’re a nature lover who love discovering new place, then you shouldn’t miss Lo Mo Cave. As one the places that successes in preserving the indigenous culture of local ethnic minorities, Ba Be Lake sees the Tay culture thriving over the years. When come to Ba Be, you shouldn’t miss your chance to watch a performance of Tay people called ‘Hat Then’ (Then Singing) which is a unique folklore art of Tay, Nung and Thai groups in northern Vietnam. Then Singing is remarkable cultural activity in Bac Kan, viewed as having an important value in the life of the people here. ‘Then’ means ‘Thien’ or ‘God’ referring as the singing of God’s melodies. 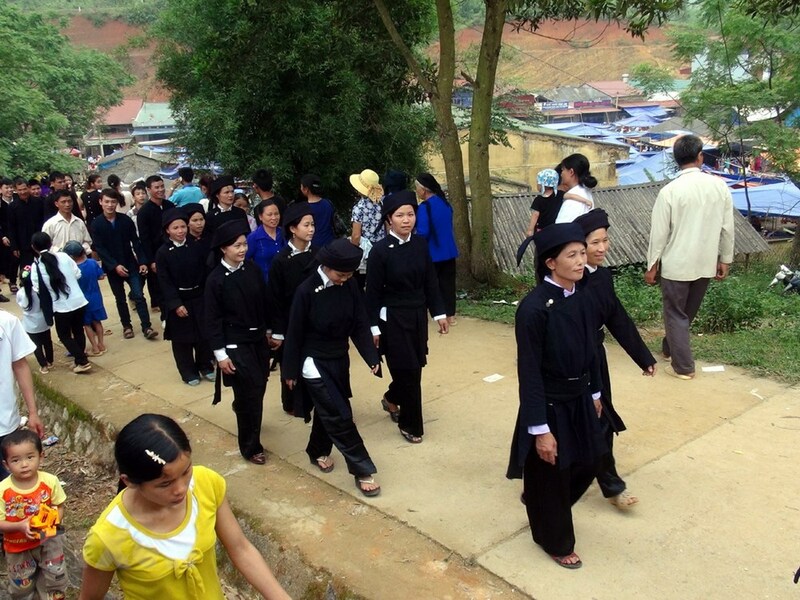 Tay young women will wear their traditional black dress and sing along with ‘Dan Tinh’ playing. Then Singing is dedicated to the God in the wishes of the people for peace, good harvest and prosperity. 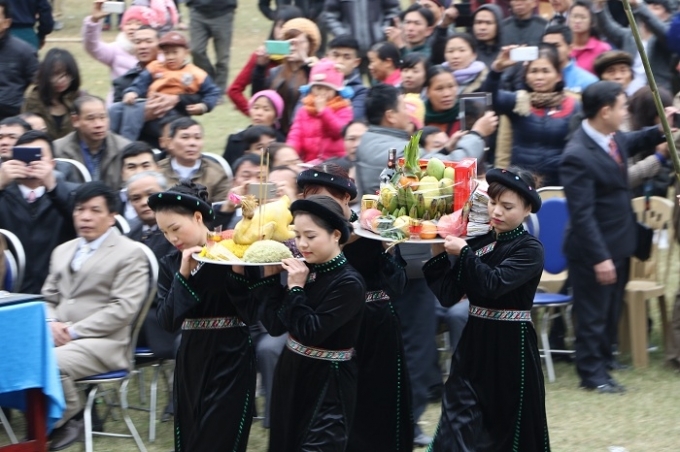 Long Tong festival is one of the oldest and most important festivals in terms of cultural values in Vietnamese culture. According to Tay and Nung language, ‘Long Tong’ means ‘go to the field’. This festival is a grand celebration to send the wishes and faith to of the people to the gods for a year of good weather, harvest, comfortable life, health and happiness for all the villagers. Festival’s main activity is God of agriculture worshiping. Exciting outdoor traditional games are rice cooking contest, singing contest and many more. From the rebuilding of An Ma temple in 2006, an annual festival is held to honor many historical and religious figures together with the widow in the Ba Be Lake’s legend, on the 6th day of the second month of lunar year. Come to An Ma islet in this time of year, not only you can see the cultural practice of local people here but also enjoy the beautiful natural landscape on the islet. This love market only gathers once in a year, on 25th day of the third month of the lunar new year at Xuan Duong commune, Na Ry District. Often compared to the love markets of Ha Giang and Sapa, Xuan Duong love market is distinctive in its own rights. The people who participate in this love market are ethnic people from local Tay and Nung groups and surrounding areas. Originated from a touching story of a young Tay couple who loved each other but were separated due to bad fate, the love market is an event where couples who couldn’t get married can come and see each other. 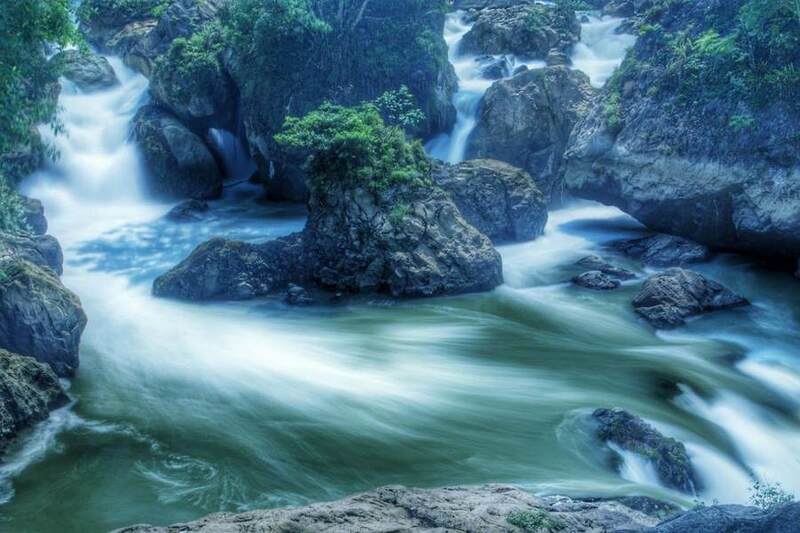 Located only 185 kilometers from Ba Be Lake, Ban Gioc Waterfall is a great match for Ba Be Lake with its dramatic landscape. Ban Gioc is the widest waterfall in Vietnam, located on Vietnam – China border, completely surrounded by pristine and primitive nature. Come to Ban Gioc, it’s such a joy to get away from the world to be totally engulfed in the natural beauties. Besides Ban Gioc, Cao Bang has plenty other sites to admire such as Nguom Ngao Cave, Pac Po Historical Site, Trung Khanh and Phong Nam Valley to name a few. 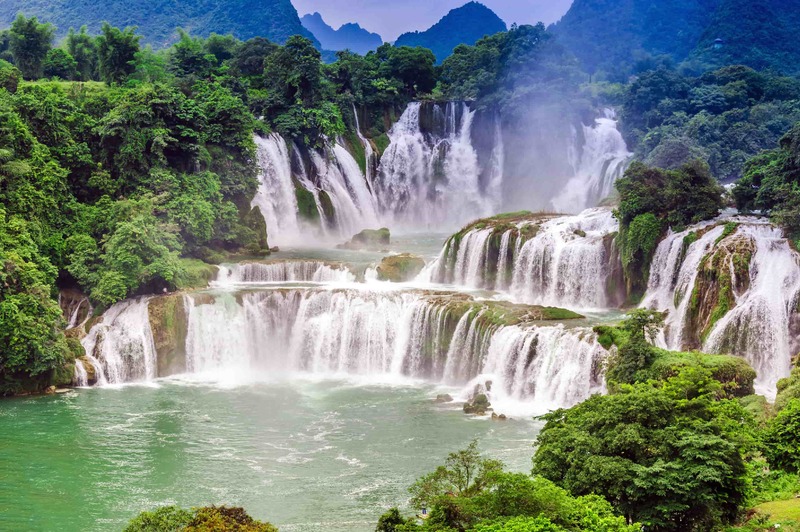 For a comprehensive Cao Bang – Ban Gioc Travel Guide, see this article. In Ba Be, you can find all the typical specialties of North Vietnam made from the fresh, organic local ingredients from vegetables and animals. One dish you shouldn’t miss is Lon Cap Nach – pork that has a tender texture and wonderful taste. The pig on mountainous regions are grown by letting running and eating freely. Grilled meat of Lon Cap Nach is the best you can find in Ba Be. 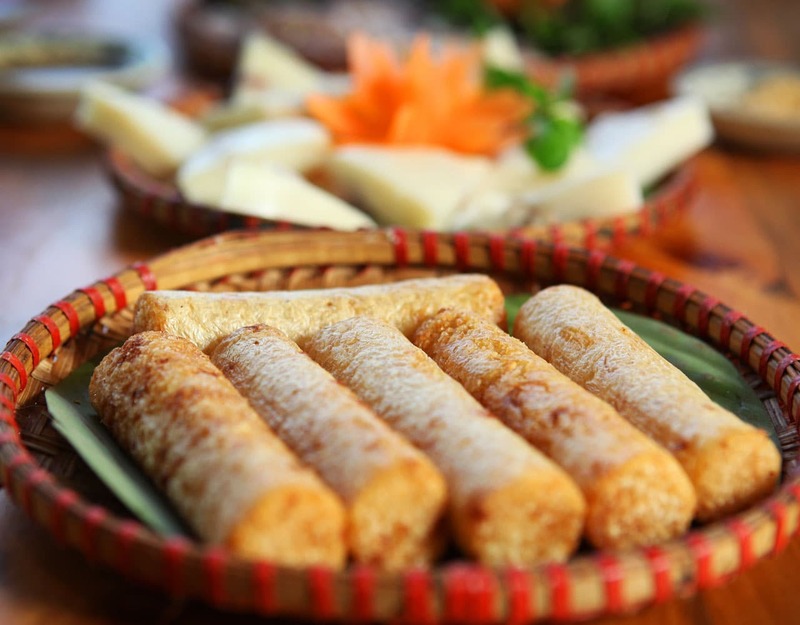 Com Lam is another specialty of North Vietnam, cooked by stuffing rice, coconut water in young bamboo tubes. The rice will be toasted with a crispy crust outside yet tender sticky rice inside. Com Lam is best when served with sesame. There are several months in year you can visit Ba Be, depending on what you are interested in. The best time to visit this beautiful lake and enjoy all the activities here is from August to October when the weather is not too hot, temperature falls in between 25-27 degrees Celsius, perfect for trekking, bicycling and caving. This is also the time the rice fields in Ba Be turn golden, ready for harvest. 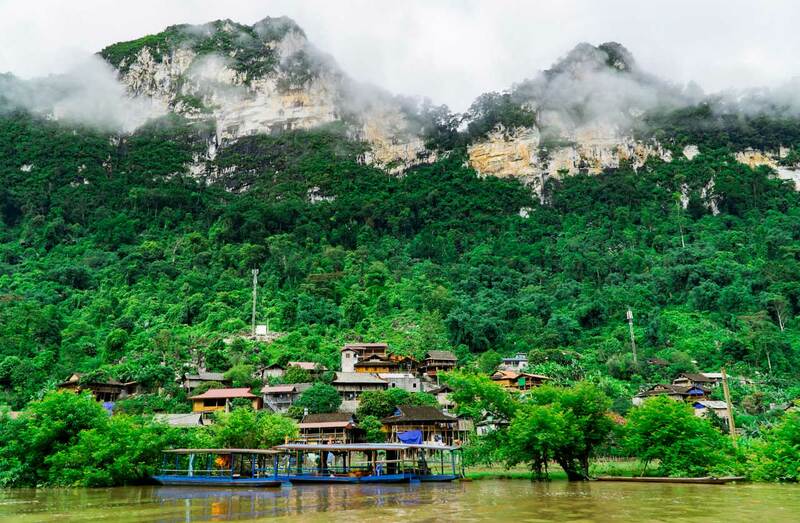 Along Nang River, you'll have chance to see such peaceful and beautiful scenery. Or you can visit Ba Be in the early months of the year for its unique, local traditional festivals like Long Tong festival, An Ma Temple festival and Xuan Duong Love Market. Ba Be is indeed a destination that have different charms in different times of year. If you want to visit Ba Be combined with Ban Gioc waterfall, be mindful of the best time the fall is most beautiful. Luckily, the best time to visit Ban Gioc is also in September and October. So you can easily visit two sites at once. 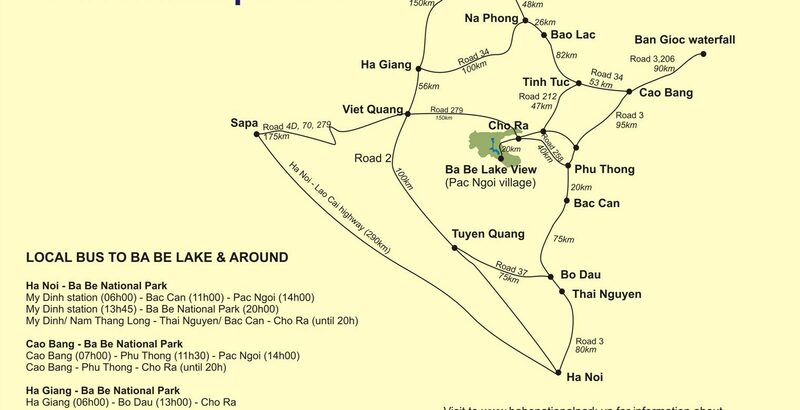 Since there are no trains and planes from Hanoi to Bac Kan, the only ways to get to Ba Be National Park is by taking local buses or driving motorbike. By bus, you can take buses from My Dinh Bus Station on route My Dinh – Cho Don Town – Bo Lu Village. Thuong Nga Company at gate 33 is the only bus that takes you to Cho Don via Thai Nguyen City, leaving at 10:00. Another minivan from the same company will take you to Ba Be Tourism Centre. Other buses from Sapa, Cao Bang and Ha Giang are also available at local bus stations. We've shown you all the best things to do in Ba Be Lake for both natural and cultural beauties. You still have more questions about Ba Be Lake, contact us now to talk with our travel consultants! Or you can send your request to us right now to email booking@asianwaytravel.com to start your trip to Ba Be lake today.